History: 28 year old patient with end stage renal disease and hypertension presents with a seizure. Intracerebral (Intracranial) Hemorrhage: Axial CT scan of the head without contrast reveals multiple hyperdense fluid collections compatible with hemorrhage. The red arrows identify intraparenchymal hemorrhage, the green arrow indicates subarachnoid hemorrhage, and the yellow arrow indicates intraventricular hemorrhage in the frontal horn of the right lateral ventricle. This young patient had multiple areas of spontaneous, or primary intracranial hemorrhage with an absence of trauma. 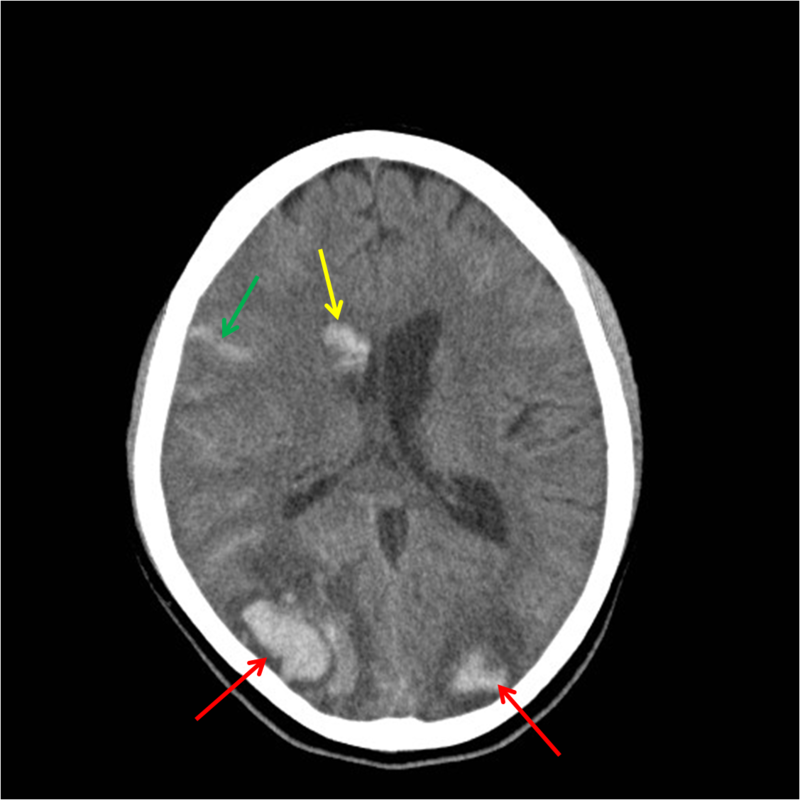 As indicated in the figure, intracranial (or intracerebral) hemorrhage can occur in different spaces in the head itself, including the subarachnoid space (green arrow above), intraventricular (yellow area above), and within the brain parenchyma (red arrows above). Other areas of intracranial (or intracerebral) hemorrhage include the subdural and epidural spaces. Traditionally, the differential diagnosis for intracerebral hemorrhage is slightly varied for each of these spaces. For example, in the setting of subarachnoid hemorrhage without trauma, the number one differential would be an aneurysm rupture. With intracerebral hemorrhage, the number one diagnosis would be hypertensive bleed, particularly if the bleed occurs within the basal ganglia. Overall, the differential diagnosis for primary intracranial hemorrhage includes hypertensive bleed, cerebral amyloid angiopathy, vascular malformation, neoplasm, ischemic infarction, and cortical vein thrombosis. This patient actually had posterior reversible encephalopathy syndrome (PRES), with the uncommon manifestation of hemorrhage in this disorder. According to Hefzy et al. (2009), hemorrhage occurs in PRES in about 15% of cases. Wow, would never have guessed PRES in this case! Which got me thinking, I think you should do an unknown case every now and then, it would be fun. Yeah, thats a great idea. I have thought of doing that, or alternatively write it like this case where the final diagnosis is given at the end of the post.